In the 2011 NBA draft, Cleveland selected Kyrie Irving with the first overall pick as other teams contemplated top talents that could help their franchise. Klay Thompson went number 11 to the Golden State Warriors, and Kawhi Leonard went 15th ending up with the Spurs. But like most NBA drafts, the rest of the picks were filled with unknown names with questionable talent and hopeful aspirations. At the back end of the draft Dallas chose Targuy Ngombo with the 57th pick, the Lakers took Ater Majok with the 58th, and the Spurs went with Adam Hanga at 59. Obscure players from places like Qatar, the Sudan, and Hungry. The Sacramento Kings had the 60th and final selection, and as tradition defines, this no- name longshot would be crowned “Mr. Irrelevant,” an afterthought while the big-name draft picks talked to the cameras, and the cleaning staff folded up the chairs. 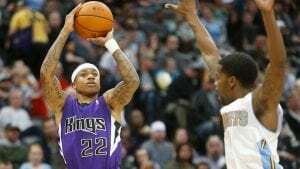 The Kings selected Isaiah Thomas, a generously listed 5’9 scoring guard from the University of Washington. Coached by current Denver Head Coach, Mike Malone, Thomas showed the Kings, and the league, that his scoring ability and quickness easily made up for his lack of size as he was soon named a starter, made the All-Rookie team, and averaged over 20 points a game in just his third season. 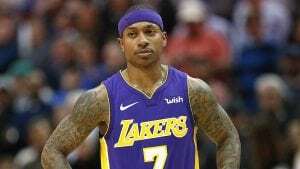 Phoenix recognized the talent as Thomas was subsequently traded to the Suns in 2014, but only after signing a 4 yr/$27 million contract in a sign-and-trade deal with the Kings. To no fault of Thomas, the Phoenix experiment was a disaster. Already sporting a backcourt of Goran Dragic and Eric Bledsoe, Thomas was asked to share time and come off the bench in the fast paced, guard heavy system. Eventually, Dragic forced a trade to Miami, Bledsoe would later do the same to Milwaukee, and Thomas would be traded to Danny Ainge and the Boston Celtics. In the following two years, Thomas would go on to make All-Star squads, gather MVP votes, and finished the 2016-2017 season averaging 28.9 points and 5.9 assists per game. The playoffs were just about to begin, Thomas was a star in the league, and with a contract about to expire, it looked like a monster payday was on the way. Irrelevant no more. 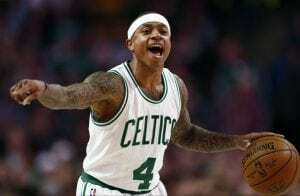 Then tragedy struck as Isaiah’s sister Chyna was killed in a single car accident during the playoffs, and to compound matters, Thomas injured his hip. 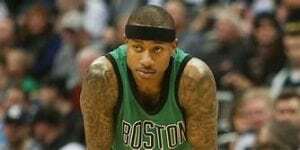 Boston would eventually lose their playoff matchup, Thomas would have surgery for a torn labrum, continue to mourn the loss of his sister, and his big money contract would be in question. Things kept getting worse. Kyrie Irving forced a trade out of Cleveland and Thomas would rehab with the Cavs, hoping to join Lebron James late in the season for a ring, and to prove he was worth big money. Despite averaging 15 points a game, the chemistry in Cleveland never fit and Thomas was a shadow of his former self. Thomas was dealt to the Lakers in a trade to make Cleveland better, and clear cap space for the Lakers. Thomas averaged 16 a game for the Lakers in limited play, then shut the season down after just 17 games to have arthroscopic surgery on that same hip. The Lakers had no intention of resigning him, few teams wanted him, and his big payday was gone. Last week the Denver Nuggets signed Thomas to a 1yr/$2 million contract to come off the bench and add scoring and depth to an already set backcourt of Gary Harris and Jamal Murray. Thomas did himself no favors when he failed to show up for a tribute at the Boston Garden, accused Kevin Love of faking illness in Cleveland, and complained about backing up Lonzo Ball in LA, but if he can return to his MVP form of 2016, Thomas and the Nuggets will be irrelevant no more.